Two Indian American teen students are named among the 10 winners in the 2019 Regeneron Science Talent Search, while the news about Kavya Kopparapu winning the National STEM Award for a cancer-related invention has not yet faded from social media. The Regeneron Science Talent Search, the United States’ oldest and most prominent competition for high school seniors in science and math, is also called Junior Nobel. 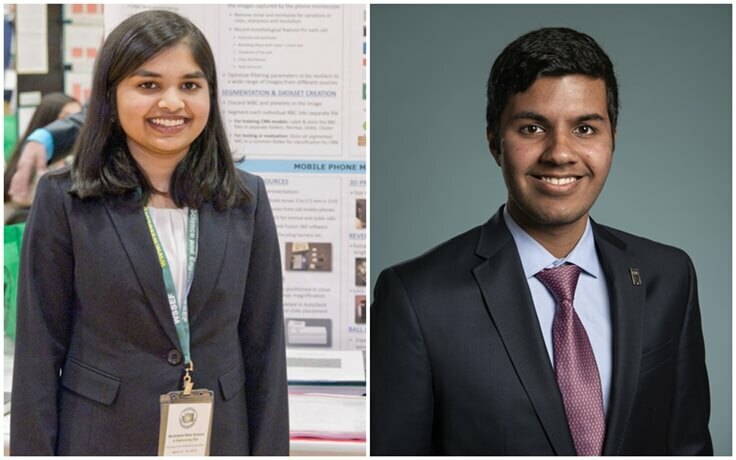 The two Indian American winners of the 2019 Junior Nobel prizes are Eshika Saxena of Washington State and Adam Ardeishar of Virginia. Their achievement is a new feather in the cap of Indian community in America. One of the top 10 winners in the 2019 Regeneron Science Talent Search, Indian American Eshika Saxena of Bellevue, WA has received a cash prize of $40,000. An Artificial Intelligence-driven system for smartphones to help detect blood-related diseases accurately and efficiently earned Eshika a place among the 40 finalists for Junior Nobel Prizes in 2019 and got her selected as one of the winners. A student at Interlake High School, Eshika Saxena developed the AI software for automatic detection of diseases through end-to-end blood profile screening. Her invention converts a smartphone camera into a microscope so that smartphone users can capture images of blood cells easily and with high-level technical accuracy. Then each of the microscopic blood cells undergoes a profound screening by the AI software, which indicates what blood-related diseases one may be affected with. Detection of sickle cell disease was the objective of her first experimentation using the AI software. Sickle cell disease is developed by a crescent-shaped cell in the blood. The experiment was a success as she was able to detect sickle blood cells against healthy blood cells ensuring 96% accuracy. Usually, doctors who diagnose blood-related diseases screen one’s blood profile, with a microscope to detect abnormalities in the blood. A resident of Bellevue across Lake Washington from Seattle, Eshika Saxena is looking to major in electrical engineering and computer science at Massachusetts Institute of Technology. She is also keen on leveraging the power of Artificial Intelligence in revolutionizing healthcare through easy-to-use applications for masses. She may pursue her passion for teaching, alongside continuing to do research once she earns a PhD degree. Though she ranks 10th among the winners in the 2019 Regeneron Science Talent Search, her AI-based innovation has been hailed as a revolutionary to healthcare for today’s smartphone generation. She has collaborated with nonprofit organizations in the ‘sickle belt’ region of developing countries including India for an extensive testing of her invention titled HemaCam. A black belt in Taekwondo and Arnis, Eshika heads the AI and machine learning club at Interlake High School. Indian American Adam Ardeishar of Virginia has been awarded $150,000 for finishing third in the 2019 Regeneron Science Talent Search. His project linking a mathematical puzzle ‘coupon collector problem’ with extreme value theory, which applies to the process of anticipating the probability of maximal events, like a natural calamity in 100 years or more. Structural engineers also use the extreme value theory to calculate an amount of time for potential collapse of a bridge. The coupon collector problem is a mathematical application of Markov Chains which search giant Google uses to rank webpages, and hedge fund managers apply to their tracking of fluctuations in the stock market. Adam Ardeishar established a connection between Markov Chains and extreme value theory, in his award-winning project, to estimate the ‘average maximum values of distributional datasets,’ which is used in foreseeing the expected period of time for a maximal event to happen. A student at Thomas Jefferson High School for Science and Technology in Alexandria, VA, Adam Ardeishar is a math whiz like Apoorva Panidapu of California. He won a silver medal in the 2018 International Mathematical Olympiad. Creating origami pieces of various shapes is his favorite pastime, as the repeated folding of a piece of paper is “rhythmic, relaxing and meditative” to him. Travel Beats, a subsidiary of Indian Eagle, publishes latest visa, immigration, passport, aviation and Indian community news stories. A leading travel booking partner of Indians in USA, Indian Eagle has a proven track record of booking cheap flights for last minute travel from USA to India throughout the year.